With the PAC nDXT Remote Trainer, a remedial training regime should enable you to break into an obstinate dogs train of thoughts to grab his attention, since the dog needs to believe that his trainer has now acquired an irresistible authority when he reaches out, from almost any distance, to tap him on his shoulder. The training process should soon become a stress-free and more pleasurable experience both for the dog and for you; he should then respond more readily to your gentler and timelier, voice or whistle commands, because he will very quickly realise there is little point in protesting. And, in most situations, the dog ultimately can be weaned from the collar altogether. For a dog to enjoy a fulfilling life, he needs plenty of exercise, running free. But, how can this be possible if you cannot trust him off the lead? Well, there are very few dependable methods recommended by the experts, and whereas spray collars might offer a short term respite, certainly there are few more successful long-term, long-reach tools than a PAC remote trainer, which is equivalent to a very long, invisible line that can tingle, but never tangle. 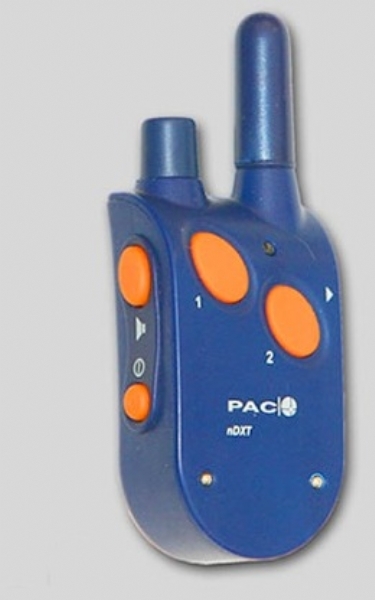 PACs nDXT Remote Trainers enable the handler simply and accurately to address his dog with an appropriate correction, according to his misdemeanour. Without him realising that the correction is coming from his collar, the dog needs to appreciate that a stimulation, at whatever style or level, is his trainers back-up option. Nevertheless, the tone (beep) warning remains the most humane style of control in distance training. But, just as wayward or criminal human activity attracts various levels of legal deterrent, the higher levels of collar stimulation need to be at hand, seldom, if ever used, to discourage some of the more serious and undesirable behaviour in dogs. As the correction is made whilst he is misbehaving, the levels used can be very low: indeed, just sufficient for the dog to associate cause with effect. To assist with heat-of-the-moment decisions, the intensity setting is easily adjusted to impart a suitable low level of stimulation for expected disobedience problems, but this intensity may be increased quickly if the level of problem encountered demands a raised level of correction to cope with the situation. To match the collars correction characteristics even closer to your dogs expected behaviour, there are two normally used, stimulation styles: the very safe momentary single-pulse, each time the trigger is pressed; and continuous pulsing style (at about 10 pulses per second), for as long as the trigger is pressed. Handlers who need to control more than one dog will be able to cater for up to 2 additional dogs (each with a separate collar), using the three style controls on the handset, one for each dog. In this basic mode, tone is available individually to each dog when the intensity dial is turned to the minimum setting. Beyond the lowest handset intensity setting, the dog whose trigger is pressed will receive the dialled stimulation level of correction, in continuous-pulsing style. The nDXT uses the most advanced, mobile-phone, radio technology, minimising the size and weight of both the collar and handset; at the same time as enabling a much longer reach, up to 1/2 mile (1km) on ideal terrain. Nevertheless, such long distance control can only be of benefit, if you know what the dog is doing at the moment of correction. Since the vast majority of RT use is reserved for the encouragement of obedience, the tap-on-the-shoulder should be as subtle as assisted telepathy, in the form of a sixth sense, which dogs perceive far more readily than we humans can. Dogs will never understand the concept of after-the-event punishment. When used as a deterrent from anti-social or life threatening activities, the RT is employed solely to associate the unpleasant, higher levels of stimulation with his actions and his actions alone. Correction is made whilst he is doing it not some seconds later when he might well have forgotten what he was doing wrong. Therein lies the most powerful rationale for using a remote trainer once again, to enhance the dogs limited logic of linking cause with effect.